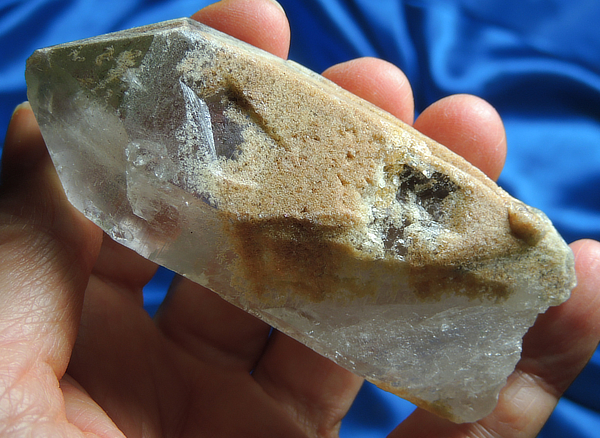 This splendid crystal is 3.2 oz and 3.3” by 1.5” by 0.8” and is from the Corinto mines in Brazil. She is clear with a bit of dark green chlorite to one side and a plethora of gold almost obliterating the green. The chlorite has caused some chlorite erosion that has totally healed through the eons. Her sides hold starbrary glyphs and include a few Leo (like they were partially inscribed and not finished) and a few Cassiopeia. She has student to one side that was “flattened” by a key and a number of keys around her base including a rather deep one. In addition, there are three hexagonal keys on her sides, perfect finger and thumb perches! Her base is healed and she is a testament to the healing process. She is in wonderful condition, save for some tiny dings, ready to work with her Keeper … and to take you to the stars! Starbraries are recognized by the presence of glyph-like markings, symbols and geometric patterns plus usually a doorway or key. By aligning fingers with the doorways or keys, you can unlock different layers, depending on orientation. Companion crystals are important - they either come with the crystal (purchased with or given with) or appear shortly thereafter. They don't have to be quartz, but work with the main crystal to unlock different layers or even gain access to the crystal itself. All starbraries work like that - the companions facilitate access, although it's possible to gain access just from the starbrary itself. (Please see the newsletters as there are several about starbraries.